We are engaged in manufacturing and supplying a wide range of Top Discharge Centrifuge Machines, which is widely used for the purpose of solid liquid separation. 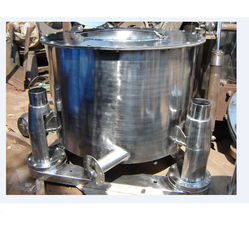 The offered discharge machine is made using high grade raw material under the watch of experts while keeping in mind the globally laid quality standards and norms. 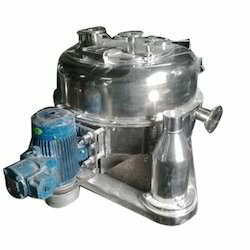 This machine has a basket, wherein a filter bag is placed, which helps to retain the solid. The release of the solid cake is done manually from the top. The main three point suspension under driven centrifuge are Bearing and Shaft, Basket, Drive and Brake. Bearing And Shaft: With an aim to bear the vibratory load a heavy duty bearing is selected and centrifugal forces duly installed in bearing housing. The bearing housing ensure easy maintenance with reliable performance as it is designed and filled with grease. For higher accuracy, the shaft is manufactured using high grade material and balanced independently without the basket. Basket : The basket is able to bear the load given by centrifugal forces, owing to adequate thickness. In addition to this, it is perforated and duly balanced. Moreover, the base of the basket is manufactured using mild steel and inner surface is lined by rubber. Drive: The drive includes motor mounted at the basket casing driven via V belt with provision of tensioning the belts. In addition to this, the centrifuges are installed with mechanical clutch pulley at the motor shaft. Brake : The Centrifuge are installed with external shoe brake and brake liners. The brakes are heavy duty type as these are designed to bring loaded basket to halt in less time. We are highly acknowledged for delivering a substantial assembly of Three Point Manual Top Discharge Centrifuge Machines. Patrons across the nation are increasing the demand for our offered discharge machines, as these are designed keeping in mind the latest trends. Moreover, our centrifuge machines have several features like longer service life, reliable performance, resistance against abrasion and precise design. Our machines include manual band brake, which results in effective and gradual acceleration with aid of necessary belt drive. We are providing our customer with a precision-engineered assembly of Four Point Manual Top Discharge Centrifuge Machines. Our customers can avail from us these four point machines within the stipulated time frame with tailored solutions. To ensure these centrifuge machines stand tall on the expectations of our clients, we use best quality raw material and other components under the presence of dexterous professionals. The offered machines are widely admired for their reliable performance and precise designing. Looking for Top Discharge Centrifuge Machines ?